Perhaps one of the most enjoyable traditions Buenos Aires has imported from Europe is it’s 5 o’clock tea in the coffee houses that serve it! A warm submarino (a chocolate bar sunk in hot milk) or coffee with medialunas are welcome comforts as the days get colder, but there’s nothing like the cafes themselves. 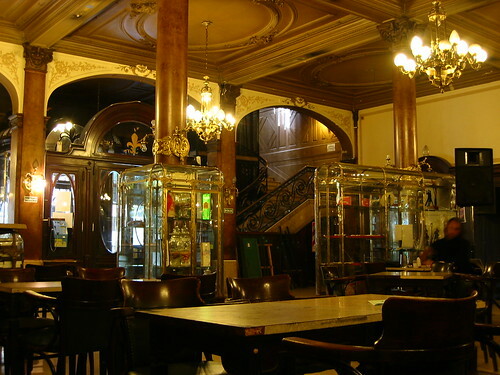 Confiteria Ideal is one of the oldest in the city. Built in the early 1900’s it is graced with high ceilings, vitrauxs, chandeliers, a marble staircase and an old lift reminiscent of a past magnificence. A wonderful place to stop in after browsing through the Corrientes bookstores or before attending to a nearby theatre function, this is also a place to go to for tango shows and milongas. This entry was posted in Uncategorized and tagged argentina, Av. Corrientes, buenos aires,, Cafe, Travel by Fierro Hotel Staff. Bookmark the permalink.